I call them my Humphrey B. Bear feet. They're rather large, because they're not just one boot - as you'll see in the technical jargon below! 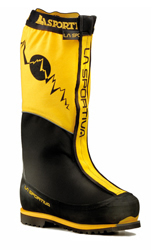 There is an inner boot (it looks a bit like American gridiron boots), that goes inside the outer boot. Over the top of them is the super gaiter. The sole is thick and has ridges for my crampons to fit into. Now I have absolutely no idea what any of that means but I do know they are light compared to other boots and they have managed to keep my toes warm so far. And that's all I need to know! 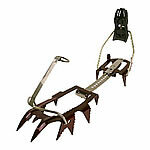 Crampons are a set of metal spikes that strap onto my boots to give me traction on the snow and ice. Kind of like the spikes on cricketer's boots, but mine allow me to go up a wall of ice (front-pointing), as well as travelling along the snow and ice. 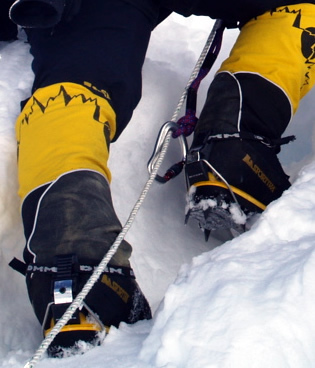 I attach anti-balling plates to the bottom of my crampons to prevent snow and ice builing up under them. If that happened the points wouldn't be able to penetrate the ice and I'd slip over!